Are you tired of spending tons of money buying new plants? After buying my first house in 2002, I was totally house poor. I desperately wanted to get some houseplants to spruce up the place, and buy plants to start a garden in my brand new backyard… but I didn’t have any money left in my budget for plants. That’s when I began learning about plant propagation. Since then, I’ve successfully propagated all of my houseplants, and many, many of my garden plants using several plant propagation methods – and you can too! Free Plants for the Taking! Once you learn these basic methods for propagating plants, you can use them over and over to multiply your plants as many times as you want. 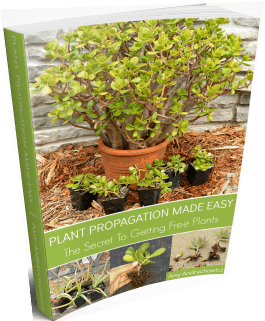 Plant propagation can be a complicated process, but I’ve simplified it in this eBook so that you can quickly become an expert at multiplying your plant collection, and fill your life with all the plants you desire (dreamy!). This guide reveals the simplest methods for easily propagating plants. It will show you exactly how you can quickly start multiplying your plants for next to nothing. As you know, one quality plant can be expensive to buy. For less than the price of one plant, I’ll show you how to grow as many plants as you want! Learn how to propagate your houseplants today!